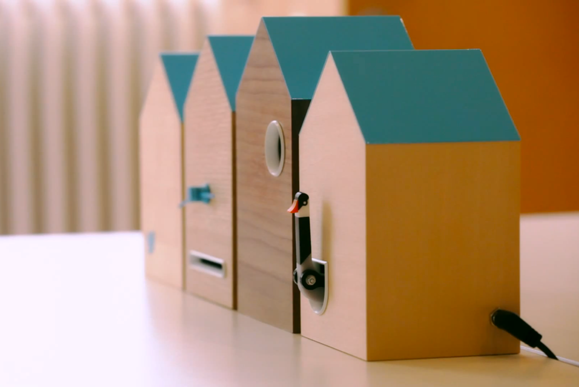 The clever folks at Berg, along with Twitter UK, have put their collective hand to an interesting Twitter-driven cuckoo clock they call #Flock. While it’s easy to appreciate the lovely craftsmanship of these clocks (they really are pretty cute), what’s even more interesting is how they’re wired into the Internet. Using an Arduino board, the #Flock cuckoo will not just make a bird pop out to chirp at the top of every hour, but it’ll also make an appearance when someone on your timeline retweets you or replies to you, or if you get a new follower. Geeks will obviously fall in love with this little doodad, but you might be disappointed if you try to find one on Amazon. The #Flock is a limited-run project meant for “very special people,” according to Oli Snoddy, Twitter UK's UK Head of Planning, and it's intended as a proof of concept for the Berg Cloud bridge. The bridge is a wireless interface that allows developers to connect their hardware projects to the Internet. Alas, you may not end up being a lucky #Flock owner… but cross your fingers. Maybe down the road, Berg will mass release a #Flock-style doghouse or scratching post. This story, "#Flock is a Twitter-integrated cuckoo clock that chirps when others tweet at you" was originally published by TechHive.